Luke and I flew to New Hampshire last week for a brief family visit. My sister Jul and her family were kind enough to let us and our parents all stay at their house. Jul made some seriously tasty dinners, including a great pork and broccoli stir-fry one night, and grilled chicken with potato salad on another. I don’t usually like potato salad, so I took a small spoonful to be polite — and went back twice more. I stopped myself from having a fourth helping only because I realized I’d eaten more potato salad than either of our teenaged sons. Jul says she used Ina Garten’s recipe. I’ll be making it soon, to the great delight of Tom, I’m sure. Speaking of Tom, he’d not only cleaned house while we were gone, but he had dinner waiting when we got home. I don’t have photos of the dish, but it was an old family favorite: his mom’s slow-cooked chicken with water chestnuts and a creamy, cheesy sauce. What a guy. The leftover chicken was tender and flavorful. Tortilla soup beckoned, but instead I wanted to enhance that velvety texture of the chicken and went with a creamy chowder. The corn is at peak right now, so it formed the base of the chowder. Red pepper enhanced the corn’s sweetness; a single cherry pepper raised that sweetness and added a touch of heat. I’d never made chowder before, but I rarely let a lack of experience slow me down (in the kitchen, at least). I’ve made lots of soups before, and chowder is basically a soup with milk (or cream, if you’re feeling decadent) and potatoes. How difficult could it be? Not difficult at all, it turns out. I wanted — and got — a thinner stock, but if you like your chowder thick, you can 1) boost the level of butter and flour by a few tablespoons, or 2) use cream instead of milk, or 3) purée some of the soup before adding the chicken. I also like soups that have just enough broth to edge past the stew category. Feel free to play with the liquid-to-solid proportions to get the result you want. I added a handful of grated sharp cheddar for flavor and creaminess. (That, and I have difficulty making much of anything without adding cheese.) The chowder will still be tasty without it, if you’re not as cheese-obsessed as we are. I’m sending this post on to Kahakai Kitchen’s Souper Sundays at http://kahakaikitchen.blogspot.com. Look for us there, and see all the other fantastic soup-salad-sammie posts. In a large saucepan over medium heat, melt the butter with the oil. Add the onion and garlic and sauté for a few minutes until softened. Add the bell pepper and chile and cook for about 5 minutes longer. Add the corn and potatoes, sprinkle with salt, pepper, and 1 tbs. of the basil. Increase the heat to medium-high and cook, stirring occasionally, for 3-4 minutes to get a little color on the vegetables. Stir in the flour and cook for a few minutes. In the meantime, heat the milk and stock in the microwave for one minute. (This helps the soup to thicken without lumps.) Pour the hot milk and stock into the soup gradually, stirring constantly. Stir in the chicken, reduce the heat to medium-low, and simmer, stirring occasionally, for about 15 minutes until the potatoes are tender. Just before serving, stir in the cheddar. 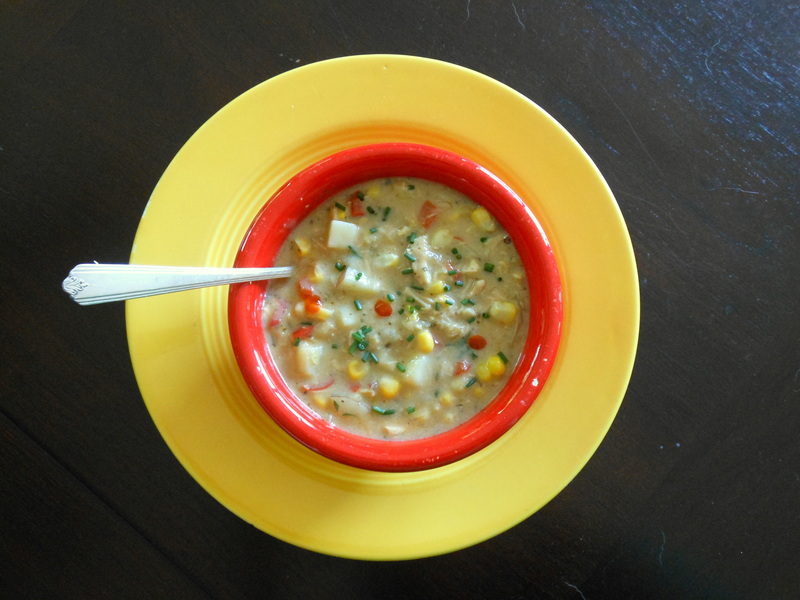 This entry was posted in appetizers, main courses, soups and tagged chicken, chowder, corn, healthy, potatoes, quick, soup. Bookmark the permalink.